Photo measuring slightly larger than 3.5 x 5 inches. Date stamped January, 1960. Otherwise unidentified, but see below. The plaque reads Commemorating / The / Raising of the 49th Star Flag / July 4th 1959 / Juneau, Alaska. Alaska is, of course, the 49th of the 50 states in the United States, and Juneau is its capital. The Alaska Statehood Act was signed by President Eisenhower on July 7, 1958, and Alaska officially became a state on July 3, 1959. Present at the Statehood Act signing ceremony was a 49-star American flag created for the occasion. Then on July 4, 1959, a day after Alaska was officially a state, that same flag was raised in a ceremony over Independence Hall in Philadelphia. Present at the Philadelphia ceremony was Alaska Senator Earnest Gruening, who apparently rushed the special flag home to Alaska Governor William A. Egan to be raised in the ceremony commemorated in the plaque above on the same day. The flag itself now resides in the Alaska State Museum, and the 49-star flag in general was in use for less than a year until Hawaii became the 50th state. 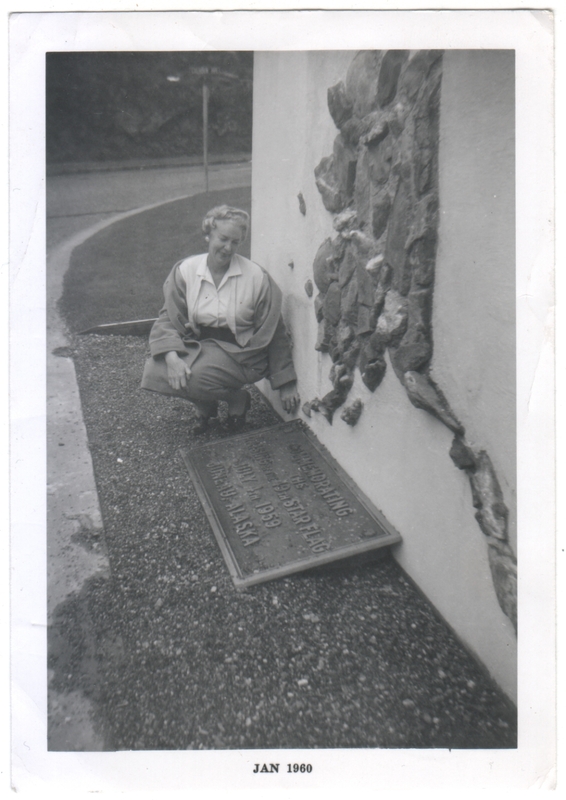 I don’t know who the lady pictured above is, or when this plaque and the Alaska wall mosaic were installed. Something about this image makes me think she may have had something to do with the plaque or the ceremony, but for all I know she could just be an admiring tourist. I’m also surprised at how balmy things appear, given that it’s allegedly January in Alaska. One other comment, as someone who grew up with all the states already in place, it’s easy to be of the mindset that it’s all ancient history. That’s why I find it useful to see pictures like this, and be reminded how relatively recently some of these major shifts happened. I didn’t realize this happened the same year my parents got married. It does make it seem so much more recent than I thought. I remember when both Alaska and Hawaii became states, having grown up with a 48 star flag. Another thing I remember, and I would need to look up the year, is when the phrase “under God” was added to the Pledge of Allegiance. Our teacher had us practice reciting the Pledge with the two new words over and over. Suddenly I feel older! Aww, sorry I made you feel old, since that’s hardly the case, even though you are older than Alaska. 😉 By the way, “under God” was added to the Pledge of Allegiance in 1954. Thanks for doing my research for me!! Glad you like it! I enjoyed looking stuff up for it. One question I had was how there were Senators and a Governor in place when the state was only a day old, and it turns out they were elected in advance, in anticipation of statehood.